Enchiladas Verdes con Col Acida y Crema Fresca - A recipe from Savor California, the online showcase for extraordinary gourmet foods and beverages from California. In a two-quart saucepan, bring 1 1/2 quarts of water to a boil. Peel the dry skins from the tomatillos and rinse in cold water. Add tomatillos to boiling water and cook until their color turns olive green. Drain tomatillos and place in a food processor. Pulse a few times until the tomatillos form a smooth sauce but not pureed. Return the tomatillos to the two-quart saucepan. Sauté diced onions in a small skillet over medium heat until translucent. Add onions to tomatillo sauce. Combine remaining ingredients. Simmer tomatillo sauce for 5 to 8 minutes. Remove from heat and cool. Shred turkey into approximately 1/4" thick strands. Combine all ingredients and with your hands, thoroughly mix. Adjust salt to taste. Gently warm tomatillo sauce. One at a time, dip a corn tortilla in the warm sauce, lay on working surface. From the filling mix, shape filling into 12 rolls about 3/4"" thick and as long as the tortillas. Place a roll in the center of each tortilla and roll the tortillas around the filling. Place in baking dish. Repeat for all 12 enchiladas. Cover enchiladas with enough of the remaining tomatillo sauce to thoroughly cover the enchiladas. Sprinkle surface with the shredded cheese. Cover baking dish with aluminium foil and bake for 20 minutes. In a sauce pan, warm the sauerkraut in its own juice. 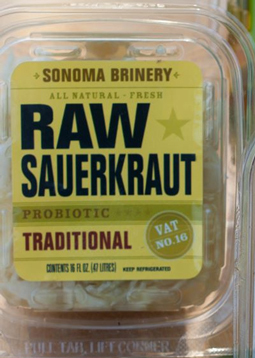 To serve, place three or four tablespoons of fresh sauerkraut, drained, on each plate as a bed. Place two enchiladas on top of the sauerkraut. Finish with remaining tomatillo sauce and a dollop of crème fraîche. Garnish with cilantro sprigs and serve.